Hokua At 1288 Ala Moana Bldg. Listing courtesy of Daniel V Loo. Listing courtesy of PRAEDIUM Investor. Listing courtesy of Jack Tyrrell & Company. In Hawaii, Luxury Living comes in many different forms, including high-rise condominiums with exceptional amenities, friendly staff, and a-la-carte services at your doorstep. 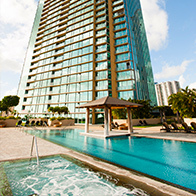 Kakaako, is home to many of the most noteworthy luxury condominiums in Honolulu. Its convenient location just on the edge of Ala Moana, close to Ala Moana Beaches, Waikiki, and Downtown, make it perfect for anyone wanting to be in the center Honolulu's exciting cultural core, without sacrificing upscale living arrangements. While Kakaako is a growing community, with new projects such as Pacifica and 909 Kapiolani just completing in 2011, several established buildings such as Hokua, Nauru Tower and Koolani are noted as the top-level in luxury condominiums in the state. Most of these luxury level buildings feature spacious 2 and 3 bedroom floor plans, with interior square footage exceeding average single-family homes. At Koolani 2-story penthouses feature private rooftop decks with panoramic ocean, city, and mountain views. To Find out More About Condos in Kakaako contact our Kakaako Specialist or call 808.971.7711.